How Should I Clean and Treat My Butcher Block and Wooden Utensils? Our Special blend of Mineral Oil and All Natural Beeswax is just the answer. 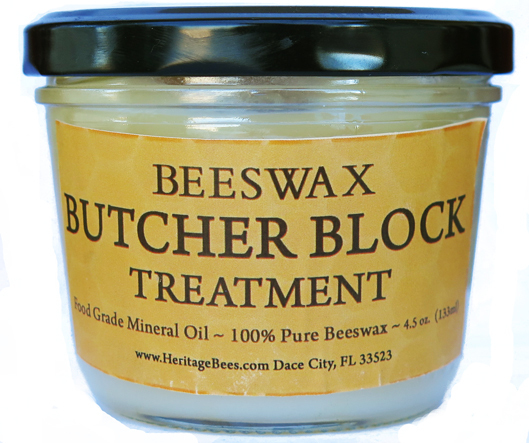 Heritage Bee Farm All Natural butcher block treatment has been specially mixed to be able to treat all of wooden kitchen utensils to restore them to near new quality. A fresh look for your butcher block countertop doesn’t haven’t to involve the headache of extensive sanding to rejuvenate the surface. An application of Heritage Bee Farm food-safe treatment can restore the surface’s sheen and help recondition with each application. Want a fresh look for your butcher block surface? Try one of these methods for countertops, wooden spoons utensils and cutting boards alike. For the most noticeable transformation, try our treatment containing a combination of mineral oil and beeswax. The beeswax will help fill in voids or small crevices from age or use (i.e. knife marks or cracking.) Through continued applications, the natural waxes help prevent drying and cracking and protect the wood. How to Apply our Butcher Block Treatment and Conditioner. Wipe surface with a clean cloth: After allowing second coat to soak, wipe any excess oil with a clean cloth.